The quantification of mass transfer through auxiliary karst systems is addressed by using a specific point dilution long-term tracer test. The physical functioning of such systems is usually only inferred by hydrodynamical and environmental tracer data, whose interpretation often relies on invalidated assumptions. The new approach is a way for experimentally validating or complementing the classical approaches. The lake of Fontaine de Rivîre is an auxiliary karst system in the Frasnian limestones of the Ourthe Valley in Belgium. Its particular confinement was studied by conjunctional use of natural responses and single-point dilution tracer test, with an injection of 41 g of uranine on 22 March 2017. The tracer test was monitored during one year using fluorometers, water and charcoal samplings at five points in the lake and six points at the surface (no connection having been established outside). A slow flow (in the order of magnitude of 1 m/h) of the lake could be observed and some mixing processes identified. The dilution of the tracer along the year indicates an average discharge of only 0.16 l/s. This low discharge is compatible with the high confinement of the lake also proved by its high homogeneity and stability (temperature and conductivity). However, the level fluctuations are apparently not compatible with this renewal, and especially with the low rate of dilution of the tracer observed during winter in the lake. This can thus be explained by pressure transfers from the surroundings, without necessarily high fluxes of water. The delays for the responses have also been quantified by cross-correlations for the whole period of monitoring from 2007 to 2018. This research was not supported by any fund. This is a good reason why we are especially grateful to those people who contributed to the achievement. The owner of the property Ranscelot is acknowledged for authorizing the access to the cave and allowing it to be protected for scientific studies. J.-M Marion provided great help with his feeling of “real” geologist and providing unpublished maps. Johan Derouane contributed to the GIS management. The lake has been photographed many times, but the best picture is here included thanks to Paul De Bie. 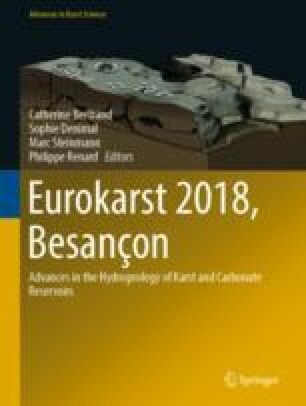 Finally, I would like to express my gratitude to Alain Mangin (†) and to Michel Bakalowicz who showed me the way and motivation for understanding karst aquifers.